My name is Brian Madeley. I started my career after finishing high school in 1977 when I took a position as an Apprentice Light Vehicle Mechanic in a small high-caliber auto repair centre in Europe. Throughout my career, I worked for a number of factory authorized car dealerships in Europe: Nissan, Citroen, Lancia, Mercedes, Porsche in varying capacities including Technician-forman and Service Manager, gaining high-quality experience and training throughout that time. 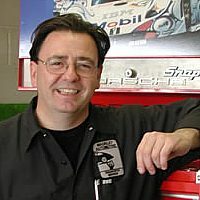 In 1989, I emigrated to Canada to take the position as an Automotive Technician at a multi line dealer in Kingston, Ontario (BMW, SAAB, Mercedes, Subaru and Suzuki). In 1995, I opened my company, Madeley Automotive & Diagnostic Service Ltd with a commitment to providing the motoring public with the best and most effective service available for European, Japanese and Domestic vehicles. We are small enough to give you the Personal Service that you deserve, yet large enough to provide for all your automotive needs. There is less chance of miscommunication common at dealers (service writer-manager-foreman-technician). When you bring in your vehicle, you speak directly with me, or the technician assigned to your vehicle, we do not have a problem with you inspecting the vehicle in our shop, or talking to the Technician concerned directly regarding your vehicle. We have the Training, Experience and Specialized Equipment to maintain and repair your vehicle right. engineWe are dealer trained and associated with both BOSCH and the AC DELCO Road Scholar Training program. Almost every month, we attend technical training seminars addressing current repair and diagnostic issues. In the last year alone our Technicians have averaged over 128 hours or over three weeks of dedicated training. During the last twelve months I have invested over $30,000 in specialized equipment so we can repair your vehicle more efficiently. Madeley Automotive & Diagnostic Service Ltd is a service-oriented repair facility, and we value our customers. In response to independent questionnaires asking, “Were you happy with the service performed at Madeley Auto & Diagnostic Service?”, “Was the work completed promptly at Madeley Auto & Diagnostic Service?”, and “Would you recommend Madeley Auto & Diagnostic Service to your friends?” I am proud to say that we received over 98% approval from our past clients. We are less expensive than dealers. I want to be your repair facility. I want to work on your vehicle every time you require service/repairs…not just once! I will take the time to explain the things we do to your vehicle. I will not laugh if you are not mechanically inclined. I will prove to you that you made the right choice entrusting your vehicle to Madeley Automotive & Diagnostic Service Ltd. I am a Member of The Institute of Diagnostic Engineers. I am a Class “A” technician (interprovincial seal). I am a ASE Master Technician (Institute of Automotive Service Excellence). There are a number of ASE technicians in the Greater Kingston and Area, but there is only one ASE Master Technician…myself. I sit on the executive committee of I.G.O. (Independent Garage Operators – Kingston Area). I am a member of the Apprentice Advisory Committee for Loyalist College in Belleville. Finally, I’m proud to mention, that the CAA has announced that they approved a second of their Approved Auto Repair Facility’s in the Greater Kingston Area to carry out their unbiased Diagnostic and Mechanical Inspection Reports. That facility being Madeley Automotive & Diagnostic Service Ltd.